Here is my small drawing of the head of a crow. 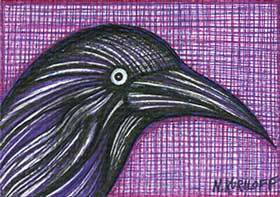 This crow is mostly black in color and is surrounded by a background consisting of purple, magenta and pink color! I created this piece mostly through the use of line. The background was created exclusively through the use of line. If you wish to purchase this drawing you may do so via Ebay here or by contacting me on this post. Thanks you for viewing my artwork, as always!